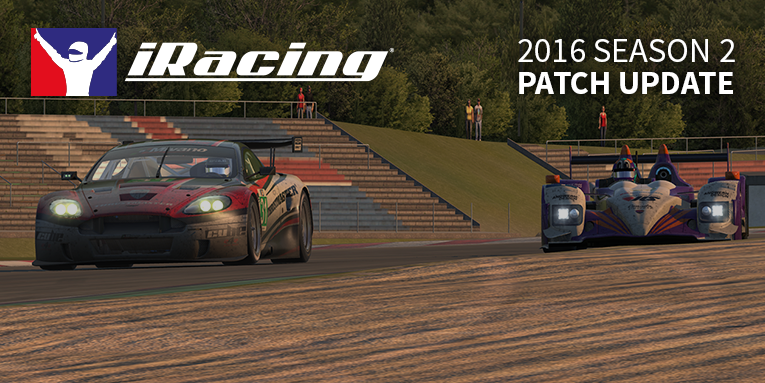 A week after the latest patch iRacing will release another mid-season patch update. This patch aims to fix several remaining issues from the update of last week. Among the updates are some tweaks to the website, netcode, tires, voice chat and some cars. The full release notes are below. – Functionality of the Race Panel has been restored when the user is on the Series Stats page. – An issue preventing racer counts from populating correctly, as well as race position selection from displaying, has been fixed. – Fixed an issue with Heat Builder that was causing Position Builder and Racer Count to throw an error. – Added functionality for scrolling while dragging racers around the Race Setup Grid. – The “Past Seasons” page has been removed from the “Results & Stats” section of the website. – Fixed an issue where sometimes the server would not use the space available to transmit opponent cars to you, leading to cars disappearing, especially when you were on or near pit road. – Fixed an issue that was incorrectly interpreting the values implied by your “My Account/Preferences/Connection Type” selection. This incorrect interpretation made the system think you had less available bandwidth than your selection. This could have led to less data being sent to you, resulting in the display of a fewer number of cars and possibly bad or missing voice chat. – Fixed a bug where performing a driver swap would not transfer how cured the tire’s rubber was to the next driver, so the next driver would be able to continue on much faster rubber without having taken the time to swap a tire. — Please note that a separate existing bug, where the reported values in the Tire Info’s Black Box may not show the correct values during a driver swap, has not been fixed at this time, but you may be assured that the physics and racing behavior are working correctly. – Fixed an issue that could have caused your own voice chat to be discarded instead of being sent to the server, especially if your bandwidth selection, in the “My Account/Preferences/Connection Type” dropdown on the website, was at the default “128K or faster” selection (which is the minimum value). – The black backing of the IZOD logo on the nose of the vehicle has been removed. – The time variance for re-fueling during endurance races has been reduced significantly, making total pit stop time more consistent. – Adjusted the Energy Recovery System (ERS) so that it is now able to handle throttle pedal calibrations in which the sensor reading is greater than zero when the pedal is released. Any reading less than 5% is now considered to be a zero reading for throttle. – This vehicle no longer allows fuel adjustments before a race session. It will always use a full tank, as it does when a race session begins. This fixes various issues that arose from allowing sessions prior to the race to use a different amount of fuel. This fuel behavior is now identical to all other NASCAR series on iRacing. – Added a new vehicle setup for Richmond International Raceway (Day), making the previous vehicle setup for Richmond International Raceway (Night).